Discussion in 'Map Factory' started by MegapiemanPHD, Feb 19, 2015. BlackGold is my attempt at creating a new gametype for TF2. Instead of being a CP map or KOTH map, it mixes the ideas, along with a bit of randomization. I call this mode, Turf War. 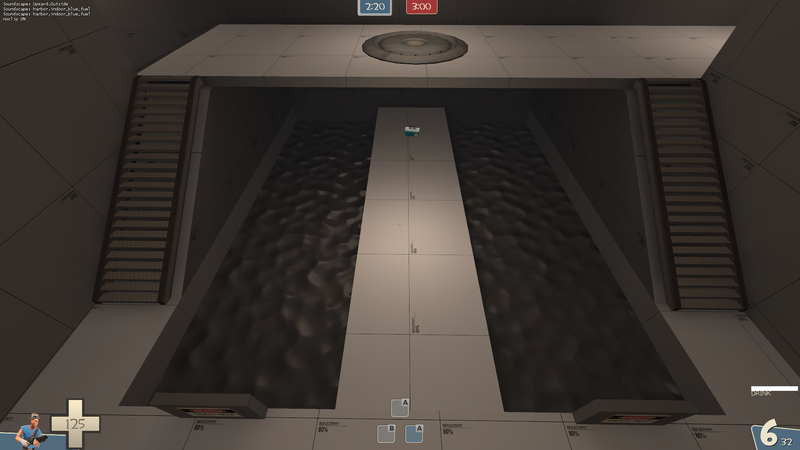 The map consists of 3 points where 1 is activated at random at the start of a round. If, say red team, captures the active point, then their timer starts to go down. If blu then captures the point, red's timer pauses, the point is set to neutral, and a new point is chosen at random to fight over. 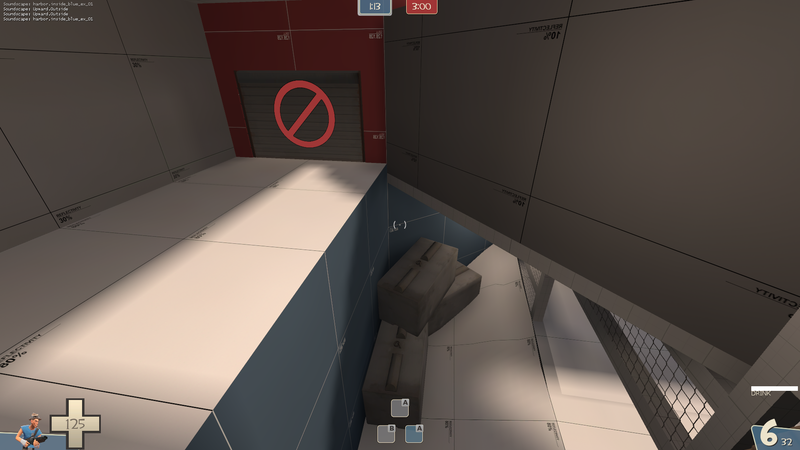 This idea originated during the TF2maps 72 hour winter contest 2015. While the map I made for that was a mess, I feel that I've streamlined the idea and have made it easier to understand where to go when. I won't know for sure until I get a few tests in though. -hud shows points as locked when they are not sometimes. It's not consistent and none of the points are set to show this in the hud. -Points only glow blue. I hope for them to glow neutral when no one owns a point and then change depending upon the owner. I've yet to get this working and even with the Team_Train_Watcher set to any team, they will only glow blue right now. -Sometimes the Announcer will talk over herself. The standin-type gameplay looks exquisite, and the gamemode idea seems like a whole bunch of fun and will probably successfully feel like a more ecstatic and fast-paced version of koth. A few things I don't like however: A looks somewhat choked, bland, and flat. Liven it up a bit! Use what you did at C! The last thing I need to say is learn from standin's mistakes, and make the map feel more flowing and give points more diversity. It's a little hard to do that if the points have 1 direction you need to face and no flanks. Awesome idea, I'm glad you're giving this gamemode another try. Point A is way out of the way compared to B and C, which are fairly close to each other. I can imagine that, for this game mode to work, the teams need to be able to quickly rotate to the next free point once a point is capped. I'm not sure just from looking, but I can imagine that the long run to A will be tedious. 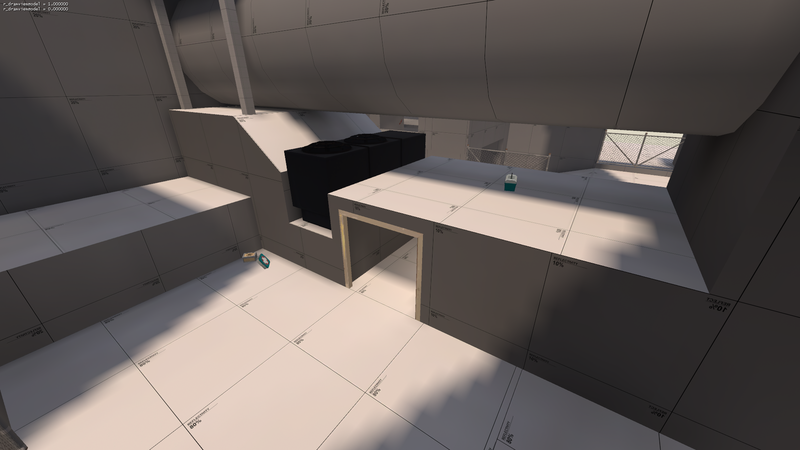 The structure of your spawn room is quite novel. 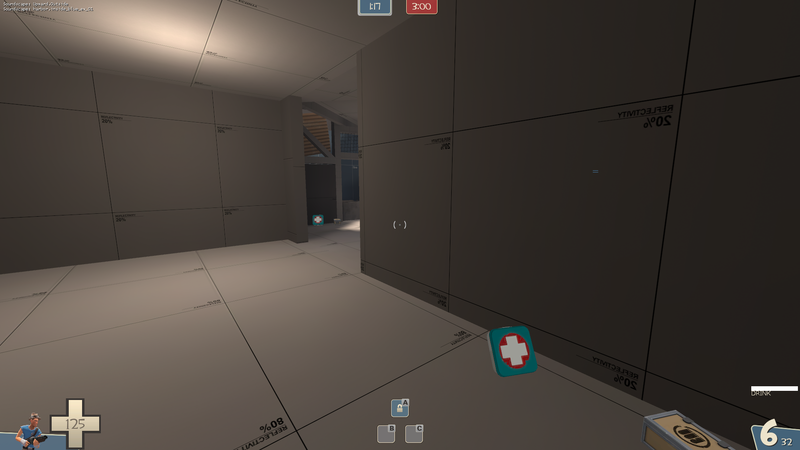 Structurally, it solves the problem of having 2 spawn points in the center of the map, while remaining symmetric. But...I feel as though it needs to be set up so that players are presented with the option to go A, B, or C from the moment they spawn. As it is now, you either spawn facing AB or AC. And I also heard the announcer give the alert message twice. It seemed to happen once when the point was being capped, and again when the capture meter fell to zero. 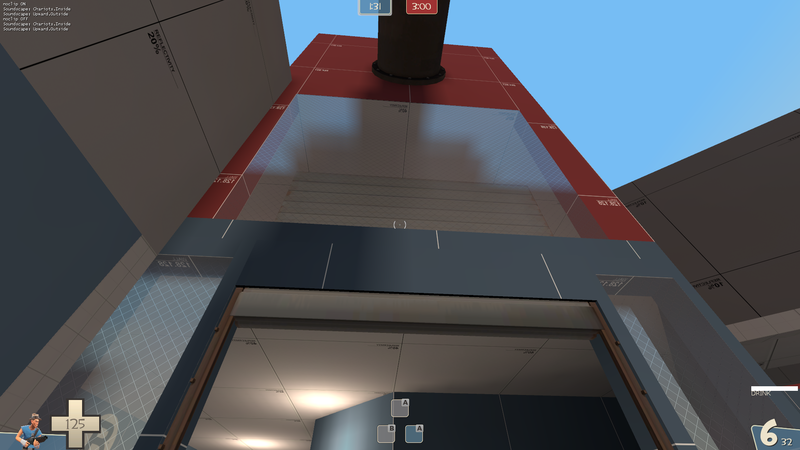 Right now each point is the same distance from the side spawn door, about 3500 hammer units. I did notice that B and C are much closer to each other than A and am not sure how to fix the issue while keeping each point the same distance from spawn. I could stretch the distance between B and C to match between B and A but that's over 6000 hammer units and would make the map a bit too big I feel. The map is already pretty small though so I wouldn't want to shrink the distance between each point and spawn. Allrighty, time to spam another map's thread with a bunch of pictures! 1. THE GAMEMODE DOESN'T SEEM TO WORK. I might have made a mistake, but after capping a point no new ones are selected. This happened for both rounds I "played"
2. Confusion. I'm somewhat familiar with your experimental gamemode, but as a new player (*insert "too confusing for new players"-joke here*) I wouldn't have a clue of what was going on. That's mainly because your HUD shows that all points are available, when they're NOT. Lock the unavailable points to show the player where to go. I know making a new gamemode inherently will confuse the players, but you should try your hardest to try to explain it with the announcer and the goal text. You could even add those Hydro dynamic arrows to point the player to the right direction. This is really important btw, as confusion leads to frustration VERY easily. 6. seriously? 16 seconds?!?!?!? That would mean spawntimes between 16 and 32 seconds. WAAAY too much. 8 would be amuch better starting value, you can change this later. 7. The spawns being ontop of each other is IMO a great idea, but you gotta be careful of people like Layl :^) who would take advantage of this and spawncamp the other team. Exhibit B: Two medium kits close-by, where (I'd think) 1 would be enough. You want the medics to have something to do, don't you? This oil could be a tiny bit lower to indicate to stupid people - that just jump in it to see what it is (like me)- that it's a death pit. Having the oil maybe 32 HU lower will make the player realize that you can't get out from there. And when they think that, they won't wanna jump in as eagerly. 10. ALSO in this same pic: the health kit (again unnecessarily large, should be a medium IMO) could be moved closer to the viewer (or downward in pic). This is so that you can SEE the pack from standing on the point. Don't just tuck it away to a corner for shame! 1. The game mode does work. Points are only randomized when a point is lost. If, say Red Team, caps the point, they keep it as their timer goes down. If Blu caps the point from them, their timer stops and a new point is chosen at random. 2. The plan is to have the unavailable points lock but I can't get them to do it right now. 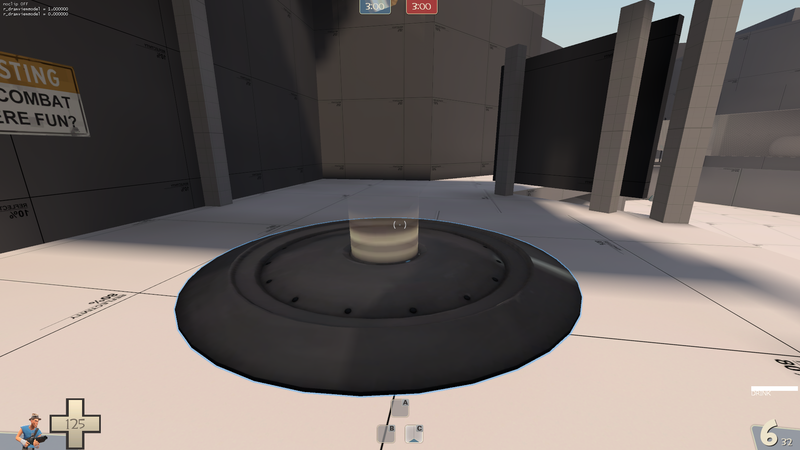 I set the cap to locked at the start of the round, I tell them to lock and unlock via logic and nothing happens. Sometimes the hud will show them locked when they are not after they are capped when I don't have them set to lock at all. The glowing points are meant to alleviate confusion but I'll try to do more if that isn't enough. What do you mean by the Hydro Dynamic Arrows? Idk what you mean by goal text, I have tf2 text that will show up on screen at the start of a round, granted it will only last for a few seconds for some reason. 6. The map is set to 10 second respawn times, idk why they last 16 seconds but it will be fixed in the future. 9. To be fair, I did put "Danger: Death Pit" signs right next to the oil and in view from each of the doors into that room. Oh I thought you get to cap each point/round. My bad. People never read signs. They always go left when there's an arrow (right in front of them) telling them to go right. Anyways, moving the oil down a bit would help telling the players it's a death pit. Alpha 2 has been released in which I have addressed some of the previously mention issues. Still haven't gotten the blasted locking thing to work! This new gamemode is really good : a cp and koth mixed. But when I open the .vmf map in hammer (or open in the game), some props take a "error" message. So where can I found these props to place in my tf folder ? I'm turning my game in OSX but for you (or for PCs), this missing textures has been removed ? It's me or you ?! 4. If you have an idea of a easier way to explain the map, I'd love to hear it. There is a limited amount of space to use and that's the best I've got so far. You should not receive errors in game since I've paked all the custom content into the map. What do you mean you opened it as a .vmf in hammer? Did you decompile my map? I will release a prefab of the game mode once I've got everything working correctly but please don't decompile my map unless you are looking to see how I did something you want to incorporate into your own map. I think the main reason people are confused right now is that the icons don't lock properly. Once you get that sorted out, people will have a better idea what they're supposed to do right now even if they don't fully understand the long-term goal. Another thing you could try, though, is incorporating those multi-directional arrow signs from Hydro, so people are directed towards whichever point is open when they come out of spawn. I keep hearing about the multi-directonal signs but I can't seem to find them. Look in the SDK version of Hydro. What they actually do is put multiple copies, rotated at different angles, and enable and disable them depending on the round layout. They're round and electronic, so it looks like they just change the direction they're pointing.